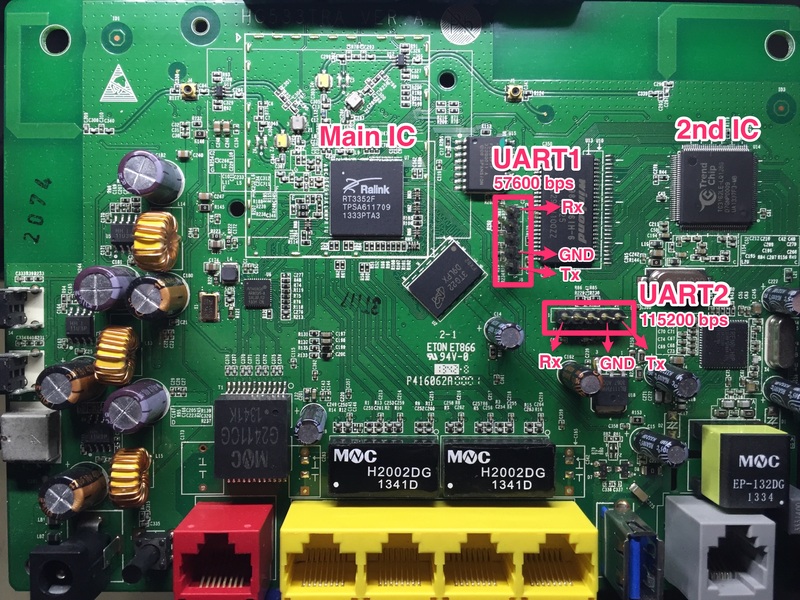 In part 1 we found a debug UART port that gave us access to a Linux shell. At this point we’ve got the same access to the router that a developer would use to debug issues, control the system, etc. This first overview of the system is easy to access, doesn’t require expensive tools and will often yield very interesting results. If you want to do some hardware hacking but don’t have the time to get your hands too dirty, this is often the point where you stop digging into the hardware and start working on the higher level interfaces: network vulnerabilities, ISP configuration protocols, etc. These posts are hardware-oriented, so we’re just gonna use this access to gather some random pieces of data. Anything that can help us understand the system or may come in handy later on. Please check out the legal disclaimer in case I come across anything sensitive. Full disclosure: I’m in contact with Huawei’s security team; they’ve had time to review the data I’m going to reveal in this post and confirm there’s nothing too sensitive for publication. I tried to contact TalkTalk, but their security staff is nowhere to be seen. We get our serial terminal application up and running in the computer and power up the router. 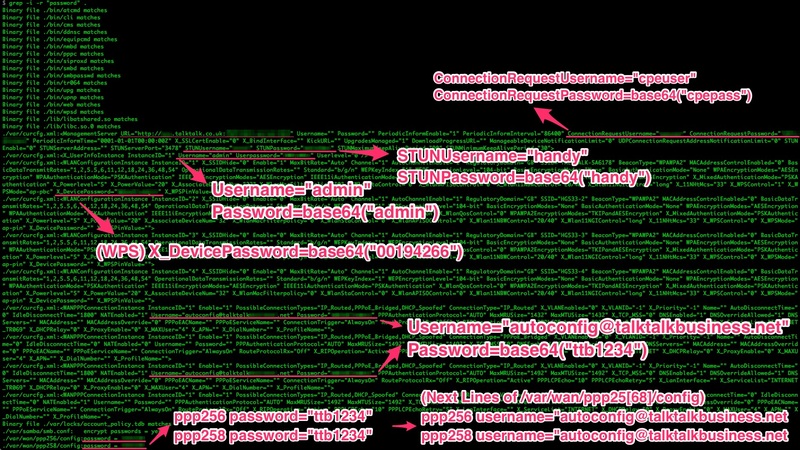 We press enter and get the login prompt from ATP Cli; introduce the credentials admin:admin and we’re in the ATP command line. Execute the command shell and we get to the BusyBox CLI (more on BusyBox later). Busybox: A small binary including reduced versions of multiple linux commands. It also supplies the shell we call those commands from. Lower level interfaces are less intuitive, may not have access to all the data and increase the chances of bricking the device; it’s always a good idea to start from BusyBox and walk your way down. For now, let’s focus on the boot sequence itself. The developers thought it would be useful to display certain pieces of data during boot, so let’s see if there’s anything we can use. Intel on how the external flash memory is structured will be very useful when we get to extracting it. We’ll have to deal with the compression algorithms when we try to access the raw data from the external Flash, so it’s good to know which ones are being used. help doesn’t mention the shell command, but it’s usually either shell orsh. This ATP CLI includes less than 10 commands, and doesn’t support any kind of complex process control or file navigation. That’s where BusyBox comes in. BusyBox is a single binary containing reduced versions of common unix commands, both for development convenience and -most importantly- to save memory. From ls and cd to top, System V init scripts and pipes, it allows us to use the Ralink IC somewhat like your regular Linux box. You’ll notice different BusyBox quirks while exploring the filesystem, such as the symlinks to a busybox binary in /bin/. That’s good to know, since any commands that may contain sensitive data will not be part of the BusyBox binary. Now that we’re in the system and know which commands are available, let’s see if there’s anything useful in there. We just want a first overview of the system, so I’m not gonna bother exposing every tiny piece of data. /etc/: System configuration files, etc. /var/ and /etc/ always contain tons of useful data, and some of it makes itself obvious at first sight. Does that say /etc/serverkey.pem?? It’s not unusual to find private keys for TLS certificates in embedded systems. By accessing 1 single device via hardware you may obtain the keys that will help you attack any other device of the same model. This key could be used to communicate with some server from Huawei or the ISP, although that’s less common. On the other hand, it’s also very common to findpublic certs used to communicate with remote servers. /etc/root.pem: Probably used to connect to a server from the ISP or Huawei. Not sure. These credentials are also available via the HTTP interface, which is why I’m publishing them, but that’s not the case in many other routers (more on this later). With so many different files everywhere it can be quite time consuming to go through all the info without the right tools. We’re gonna copy as much data as we can into the USB drive and go through it on our computer. Once we have as many files as possible in our computer we can check some things very quick. find . -name *.pem reveals there aren’t any other TLS certificates. What about searching the word password in all files? grep -i -r password . We can see lots of credentials; most of them are for STUN, TR-069 and local services. I’m publishing them because this router proudly displays them all via the HTTP interface, but those are usually hidden. If you wanna know what happens when someone starts pulling from that thread, check out Alexander Graf’s talk “Beyond Your Cable Modem”, from CCC 2015. There are many other talks about attacking TR-069 from DefCon, BlackHat, etc. etc. The ATP CLI includes very few commands. The most interesting one -besidesshell— is debug. This isn’t your regular debugger; debug display will simply give you some info about the commands igmpproxy, cwmp, sysuptime or atpversion. Most of them don’t have anything juicy, but what about cwmp? Wasn’t that related to remote configuration of routers? 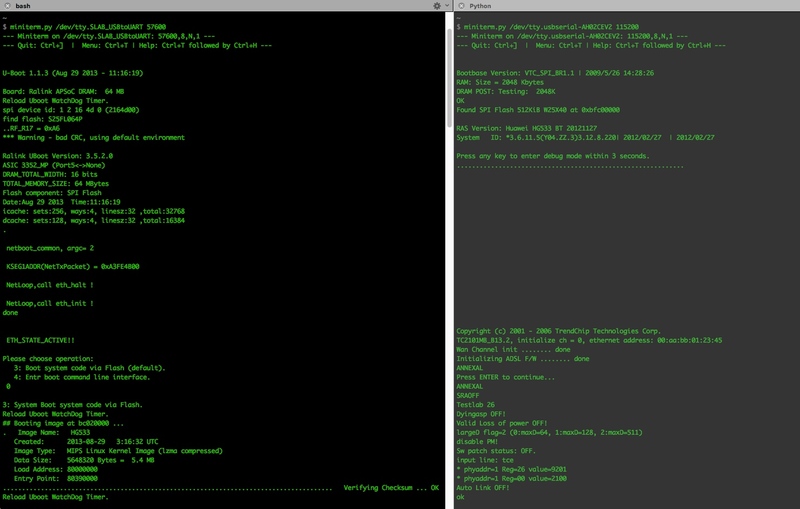 Once again, these are the CWMP (TR-069) credentials used for remote router configuration. Not even encoded this time. The rest of the ATP commands are pretty useless: clear screen, help menu, save to flash and exit. Nothing worth going into. 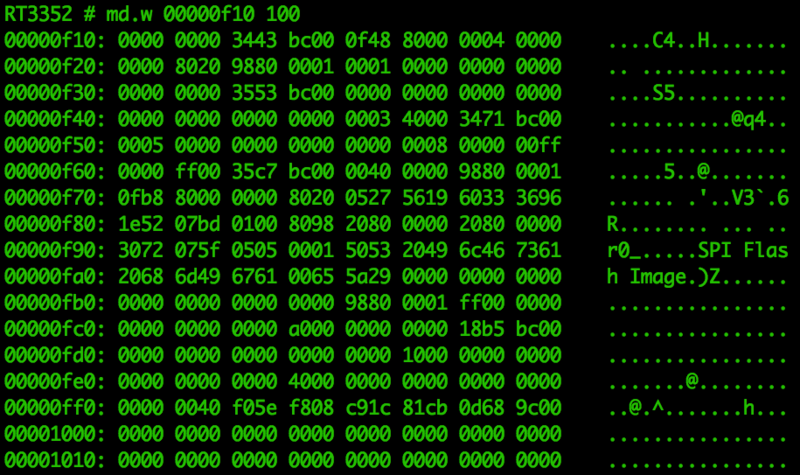 The bootloader’s command line interface offers raw access to some memory areas. Unfortunately, it doesn’t give us direct access to the Flash IC, but let’s check it out anyway. Don’t touch commands like erase, mm, mw or nm unless you know exactly what you’re doing; you’d probably just force a router reboot, but in some cases you may brick the device. In this case, md (memory display) and printenv are the commands that call my atention. We can see settings like the UART baudrate, as well as some interesting memory locations. Those memory addresses are not for the Flash IC, though. 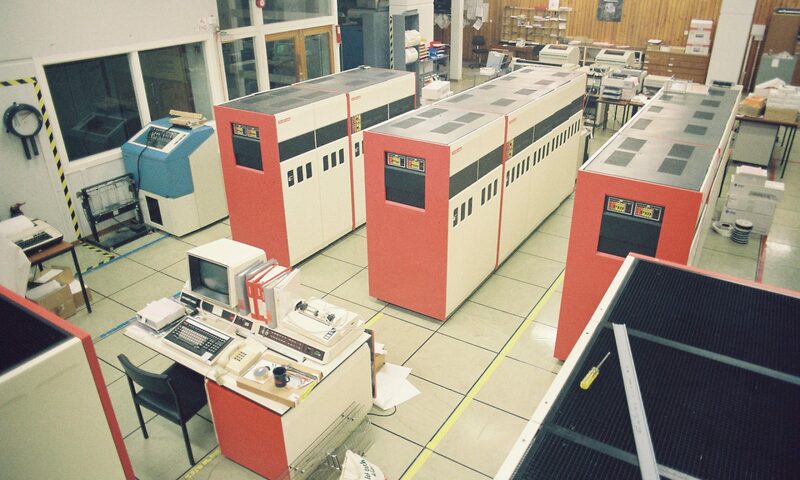 The flash memory is only addressed by 3 bytes: [0x00000000, 0x00FFFFFF]. Let’s take a look at some of them anyway, just to see the kind of access this interface offers.What about kernel_addr=BFC40000? 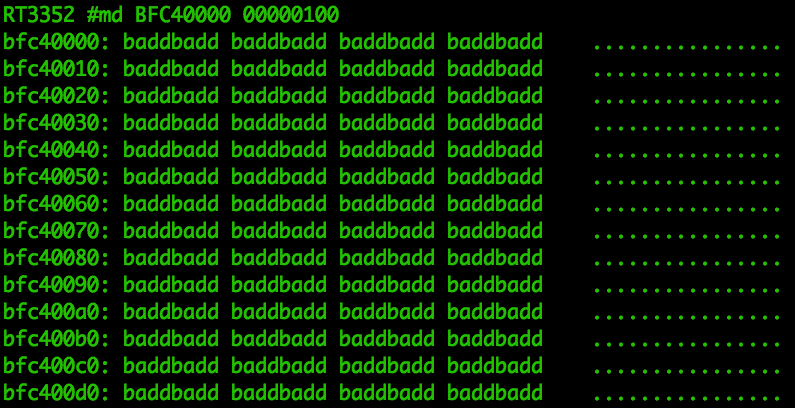 Nope, that badd message means bad address, and it has been hardcoded in md to let you know that you’re trying to access invalid memory locations. These are good addresses, but they’re not accessible to u-boot at this point. It’s worth noting that by starting Uboot’s CLI we have stopped the router from loading the linux Kernel onto memory, so this interface gives access to a very limited subset of data. And just because it’s about as close as it gets to seeing the girl in the red dress, here is the md command in action. 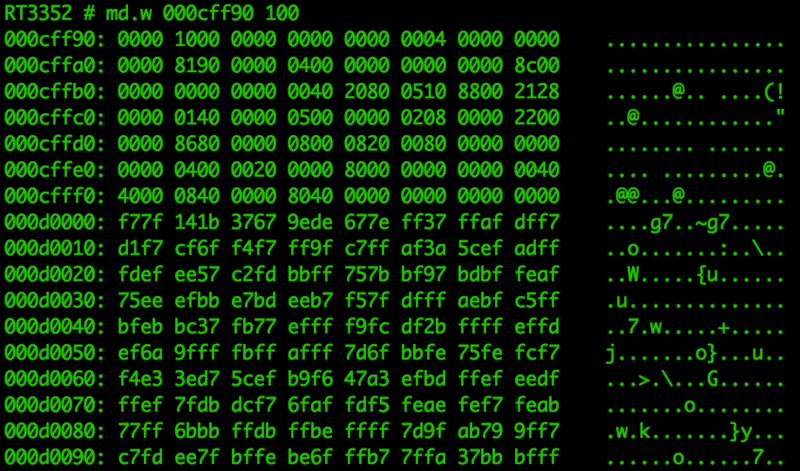 You’ll notice it’s very easy to spot that change in memory contents at 0x000d0000. In the next post we combine firmware and bare metal, explain how data flows and is stored around the device, and start trying to manipulate the system to leak pieces of data we’re interested in.